It had been ages since I’d made my own pizzas at home and since I’m effectively carb free during the week now I thought I’d treat myself on a Saturday night. Whenever I usually do pizzas I stick to the tried and tested tomato and mozzarella combination with a variety of other toppings, and don’t get me wrong that is fantastic, but this time I thought I’d ring the changes a bit! The first pizza was based on something you might find in Sicily, a thin crust with a pistachio paste, mozzarella and salami. I started off by making a standard pizza dough and letting it prove. Whilst I was preparing the paste I also put a pizza stone in the oven on maximum heat. I can’t overstate what a difference a pizza stone makes, they aren’t expensive but ensure you get that authentic crispy base and no sogginess……. There endeth the lesson! For the base, a kind of pesto I guess, you combine about a cup of shelled pistachios with a tablespoon of Parmesan about half a cup of olive oil, the juice of a lemon and salt. You then whizz in a food processor until smooth adding a little water if the mixture is too thick. 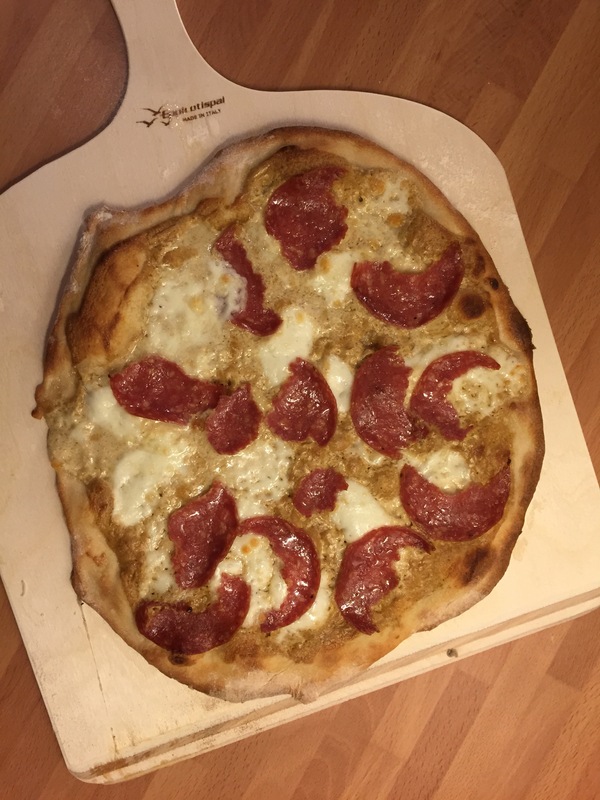 When the stone was up to heat I slid a pizza topped with the pistachio paste, mozzarella and good salami onto it and waited about six minutes until the pizza was puffed up and crispy and the cheese was bubbling. This pizza was a real triumph, the pistachio paste was rich and creamy and also s little sweet, a great combination with the creamy cheese and spicy salami. 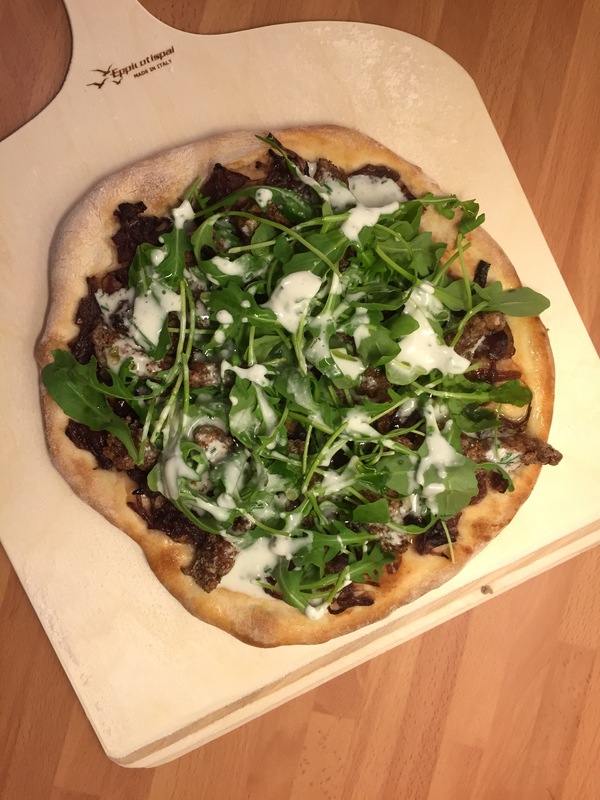 The other pizza was inspired by Tom Kerridges recipe for Crispy Beef Puff Pastry Pizza http://www.bbc.co.uk/food/recipes/beef_and_blue_cheese_89652 . I obviously slightly adapted the recipe and used a traditional base instead of the puff pastry. Hours before cooking I had sweated down and caramelised some red onions to use for the first topping, then I fried strips of beef in cornflour over a high heat until crispy assembled the pizza and slid it onto the hot stone. Meanwhile I made a blue cheese topping as Tom describes in his recipe by combined equal quantities of dolcelatte and creme fraiche, chives and salt and pepper and whizzing in a food processor. Again you can let this down with a little water if it’s too thick. Once the pizza was out of the oven it got a liberal sprinkling of rocket and was drizzled with the blue cheese dressing. 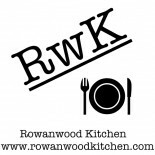 Fantastic flavours, thanks for the inspiration Tom Kerridge! Oh that looks divine. Found you on Tell em Tuesday. That looks like the perfect homemade pizza! I love a good thin and bubbly crust like that. Now you’ve got me craving pizza and it’s almost 10:00 at night! This entry was posted on May 10, 2015 by paulb in DIY Food, Snacks.